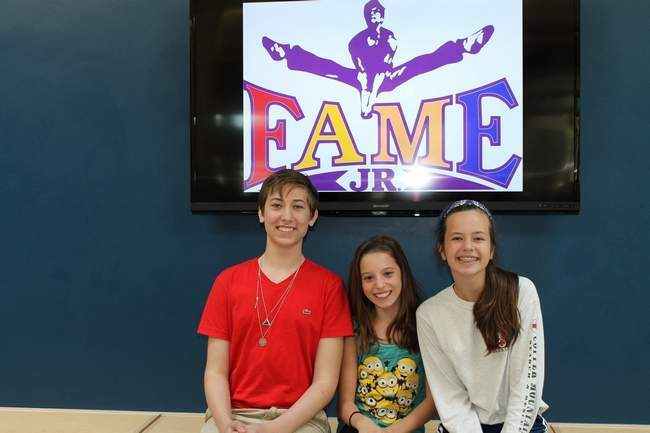 Boston Children's Theatre's production of FAME JR running July 17 - 20. Courtesy Photo / Boston Children's Theatre. Tickets on sale for July 17 – 20 performances. The Academy Award® winning film and Emmy Award® winning television series leaps onto the stage for Boston Children’s Theatre’s (BCT) Summer Studios 3 production of the acclaimed musical FAME JR. Featuring the talents of 12-year-old Annabelle Collins and 11-year-old Grace Studley of Boxford and 13-year-old Brendan Doherty of Topsfield, FAME JR will be performed in the new state-of-the-art theater at Shore Country Day School in Beverly, MA from July 17-20. Annabelle will be playing the role of the drama teacher ‘Mrs. Meyers’ in FAME JR. Last seen on the BCT stage in productions of Pippin and Legally Blonde, Annabelle has also performed with North Shore Players in Anything Goes and The Wizard of Oz. She has also worked with Moonlight Productions in Aladdin and at Spofford Pond School in Into the Woods where she is currently a student. In the Dance Ensemble of FAME JR, Grace was also last seen in BCT’s production of Pippin. She has also appeared in Neverland Theatre’s productions of The Wizard of Oz, Les Miserables, and The Little Mermaid, and with Acting OUT in Peter Pan. Grace can also be seen in the film In My Mind by Jomar Motion Pictures. Brendan will be playing the role of musician ‘Goodman (Goody) King’ in FAME JR. A student at Masconomet Regional Middle School, Brendan recently played the role of ‘LeFou’ in his school production of Beauty and the Beast. "FAME JR is a musical told through the eyes of young actors who have big talents and big dreams," explained BCT Executive Artistic Director Burgess Clark. "FAME JR’s book and score have ignited a vibrant creative spark within all our students and I know their excitement and enthusiasm for this production will have a profound effect on our audiences. Under the guidance of veteran director Mary Guaraldi, who recently directed our World Premiere production of The Homework Machine, FAME JR will be a thrilling journey for everyone in the theater." FAME JR follows a group of talented students as they make their way through 4 years at the prestigious High School for the Performing Arts in New York City. A bittersweet, and ultimately inspiring story filled with high octane musical and dance numbers, FAME JR explores the world of the performing arts and the triumphs of challenges of following one’s dreams. Directed by Guaraldi with choreography by Brian Dillon, FAME JR was conceived and developed by David De Silva with book by Jose Fernandez, lyrics by Jacques Levy and music by Steve Margoshes. The title song "FAME" was written by Dean Pitchford and Michael Gore. FAME JR will be performed by two rotating casts at Shore Country Day School, 545 Cabot Street, Beverly, MA. Annabelle Collins and Grace Studley and Brendan Doherty will be seen in performances on Friday, July 18 at 7:30 pm, Saturday, July 19 at 2 pm, and Sunday, July 20 at 7:30 pm. Tickets are $20 for adults and $15 for students. For tickets and information, visit www.bostonchildrenstheatre.org or call 617-424-6634, x222. FAME JR is presented through special arrangement with Music Theatre International (MTI). For over 60 years, Boston Children’s Theatre has served as one of the region’s premier not-for-profit theaters. Named Best of Boston® 2013 and 2012 by Boston Magazine for Best Children’s Theatre, BCT’s mission is to provide access to exceptional theatrical experiences dedicated to fostering the artistic and personal development of diverse youth, with a focus on professional training and the development of new works. Programs at Boston Children’s Theatre provide a unique chance for self-discovery and individual expression in a supportive and productive environment. At BCT, talented and motivated students gather from across traditional boundaries and nationalities to learn about themselves, each other and the world, as they create some of the finest theatrical productions in New England.